This book brings together the best of Anthony Nanson’s incisive writings about the ways that story can re-enchant our lives and the world we live in. Grounded in his practice as a storyteller, the essays range from the myths of Arthur, Arcadia, and the voyage west, to true tales of the past, science-fiction visions of the future, and the big questions of politics and spirituality such stories raise. “Anthony’s account of this scene gave me goosebumps. It put me in mind of the rare occasions I’ve experienced the pagan gods speak through somebody. It illustrates the potential within our diverse religious traditions to draw upon the words of radical and prophetic figures to illuminate and critique our current political situation and also our responsibility as storytellers for our divinities.” Lorna Smithers reviewing for Gods and Radicals read the full review here. “As a writer and poet this book spoke to the core of my own approach. It talks about the need for our society to reconnect with nature and magic through storytelling. It is intelligently written, inspiring and convincing.” Stardancer, Amazon. “This is a deeply philosophical book, asking what it means to be human, to be alive in this time and place, what it means to face up to the challenges and responsibilities of our moment in history. Given the subject matter, it’s a surprisingly upbeat and encouraging book. What I especially like about it, is that it offers meaningful ways forward to anyone who reads it.” Nimue Brown. Full review here. 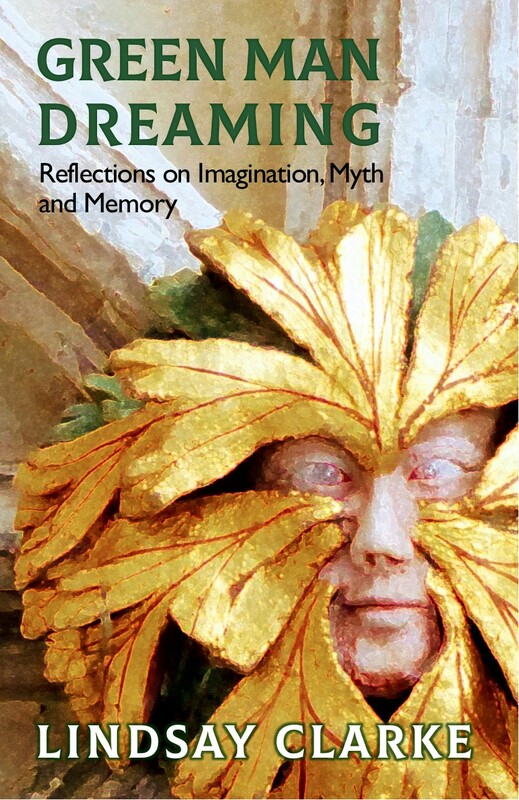 Anthony Nanson’s Words of Re-enchantment brings together his writings on myth, storytelling and the ecobardic arts, and we wanted a cover image that spoke of the discovery of enchantment out in the natural world. The image on cover the dates from a trip we took a few years ago to Turkey, and the walk to discover this place was, indeed, one of enchantment. Anthony and I have spent a lot of time in Greece, and during that time we got into a rhythm of visiting the kind of sites we like best – mythological ones. We have a huge atlas of mythological sites in Greece, with differing categories of what you might see there, from huge sites like Delphi to places where it might just be an open hilltop where some god pursued some nymph! But although the land mass that makes up modern Turkey is intimately connected, historically and mythologically to the world of Ancient Greece, we didn’t know very much about it, and reeled around from tourist spot to tourist spot feeling slightly dazed. Eventually, and still very much on the tourist trail, we came to Olympos. Now, Anthony has climbed all nine and a half thousand feet of Mount Olympus in Greece, so we were excited to be near another one. There are, apparently, over twenty Mount Olympuses in the Med, all, presumably the local highest mountain, where, logically, the gods lived. This one had an ancient city at its feet, also called Olympos, but it’s no longer a thriving port. Instead, it lurks, romantic, seemingly forgotten by time and smothered by nature, along the winding Ulupınar Stream along a path that takes you down to the sea. 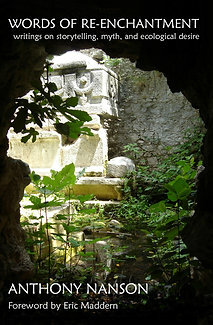 The image on the cover comes from a necropolis, a city of the dead, part of the family complex belonging to Marcus Aurelius Archepolis, and, like everything else, it has been taken back by nature. Olympos is a managed and maintained archaeological site, but the archaeologists have allowed us the magic of discovery, of seeing an enchanted place. When we were in the heat of summer, it was lush and green, and thick with flowers; the waters rippled, birds sang, and the white stone rose up out of this jungle. There buried the ship with a life as short as a day, like a broken wave. Mount Olympos is famous, too, for the fire in its head, making this image doubly fitting for a bardic book. That night Anthony was taken up see the fire that never dies on the mountain, at Yanartaş, the ancient Mount Chimaera, where flame leaps all day and night from the rock, much as we hope the fire leaps in the head of the ecobard! We all need creativity in our lives and we all have the capacity to be creative. We are all capable of being inspired, and of inspiring others. It’s not just about singing songs and telling stories – although that can and will be part of the solution, because we need to change our culture to something more sustainable. Become an Ecobard. Become a voice for the land, for the past and the future, a voice for life and for hope.